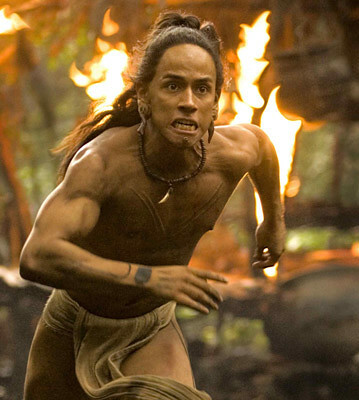 Apocalypto is the story of a young Mayan tribesman, Jaguar Paw, whose village is destroyed and the villagers killed or taken captive by a party of fierce raiders led by the intimidating Zero Wolf and taunted by the cruel, menacing Middle Eye. Because of a recent plague and drought we discover that the men will be sacrificed to appease the gods, and the women will be sold to slavery. As in all of Mel Gibson’s movies there are many inaccuracies or distortions. For instance, mass human sacrifice was more a feature of Aztec culture, and was only practiced by some Mayans that neighbored the Aztecs. The first Spaniards arrived long after the Mayan civilization had collapsed. There is no evidence to support mass graves, or even widespread slavery. The movie also ignores Mayan achievements, focusing on imagined depravities instead of their mastery of mathematics, agriculture, astronomy, literature and art. However, the film is a fable of the collapse of a society. Many of the reasons for their collapse correspond to what Jared Diamond writes about in his book, Collapse. Diamond devotes several chapters to the Mayan case study, citing drought, possibly lasting 200 years, as a factor. 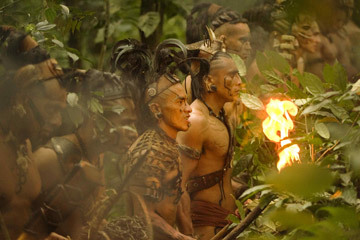 Historical inaccuracies aside, Mel Gibson’s Apocalypto is gorgeously made. The costumes, the hair styles, the tattoos and piercings were all copied from Mayan artifacts. Although, elements from various historical periods and geographic locations were conflated into one Mayan aesthetic. The Classical Period, for instance, lasted almost 700 years. So I imagine it would be like mixing George Washington’s wig and breeches, with Kennedy’s pinstripe suit and Lincoln’s top hat to represent an American aesthetic. Still, for someone not well-versed in Mayan culture, it was pure, enjoyable eye candy. The use of the Mayan language is an inspired layer of realism, with most of the cast actual Mayans. Several of the leads weren’t Mayan, but the exclusive casting of an all Native American cast lends an aura of credibility to the film. From a narrative standpoint, the story moved briskly, with lots of action. Jaguar paw’s escape is one of the highlights of the film as he begins to hunt his pursuers in his own element, the jungle. But if you’re sensitive to graphic violence, this may be a movie you might avoid. Knowing Mel Gibson’s evangelical Christian bias, the arrival of the Spaniards probably represents the salvation of a sick, heathen society. The allegory of a decaying society, rotting away from within, is reinforced several times throughout the film. A shaman tells of the story of a never-satisfied man. A girl, afflicted with disease, prophesizes destruction of the captors. All of these commentaries within the story are warnings of the possible decay that we may be facing, contributing to our own collapse. Intended or not, we are warned of the false embrace of religion that arises out of fear, whether it be sacrifice to one priest in a headdress or another bearing a crucifix. great movie! go mel ! yup, cinematically, it really is a beautifully-crafted film. Actually, at the end of the movie, the main characters walk AWAY from the ‘Newcomers’, thus sparing themselves the tyranny of yet another blood hungry bunch. The message being: Any form of tyranny is wrong. true, true. but i think gibson was also showing that jaguar paw’s village was not rotten and didn’t need saving. but the rest of mayan civilization was seriously decayed and ready to collapse. it would be interesting to see what gibson had to say about the conquistadores and their missionaries. I know, I only leave comments when you write a movie review. What can I say, I can’t get enough of them. More than the movie, what impresses me most is your knowledge of things. I admire that bru. I wish I had enough patience to read more books but I guess I learn a lot from you and movies already. kaz, you’re a film guy so that’s okay. thanks for the kind words. you need to start writing about the movies you see too. thanks AlexM. i wish my russian was better so i could understand your blog. what if we wish to embrace religion because we want to? not because we’re scared, but because we choose to?